With the looming El Niño set to affect the city by the end of the month, the Davao City Water District (DCWD) is urging its customers to conserve water. A five-hectare plantation with fully grown marijuana plants worth P3.4 million was found by authorities in Kiblawan, Davao del Sur on Maundy Thursday. The Department of Labor and Employment (DOLE) XI opens 6,608 job vacancies for the upcoming Labor Day job fair on May 1 to 2 at the Gaisano Mall of Davao. The status quo has remained a huge challenge to local Halal certifiers, an official said. 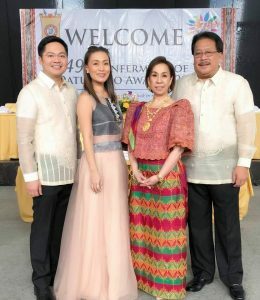 It’s a must for me to attend the Datu Bago Awards ceremony annually to represent my late grandparents, Datu Bago awardees Dr. Jose and Nurse Mamerta Ebro (2001), and relatives Carmen Dakudao-Locsin (1996) and Agnes Dakudao Locsin (2000). The Datu Bago Awardees (l-r): Koronado B. Apuzen, Ines P. Mallari, Rodolfo M. Mande, Pilar C. Braga, Mayor Sara Duterte-Carpio, Mary Ann Maceda-Montemayor, Antonio B. Partoza, Jr.
Until this time, people still ask me what the Datu Bago Award is. I still remember that in one Mutya ng Davao Q and A screening where I sat as judge, I asked a candidate who among the Datu Bago Award recipients she admires the most. The candidate just froze not having any clue to what the question was all about. 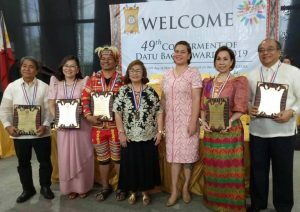 The Datu Bago Award honors an exemplary individual who has contributed to the growth and development of Davao City through one’s passionate dedication in realizing one’s advocacy. He/she serves as a model inspiration to Davaoenos in the preservation of the Davaoenos’ rich cultural heritage. The award is bestowed on a person of any nationality, living or deceased, and who has been a resident of Davao City for at least a decade. The Award is conferred as part of the celebration of the Araw ng Davao. 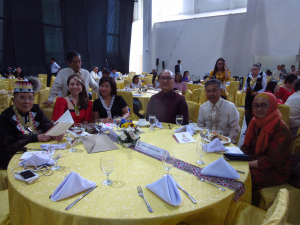 This year, I was extra excited to attend the 49th Conferment of the Datu Bago Awards ceremony on the 82nd Araw ng Davao celebration which was held for the first time at the Escandor family’s Arcadia in Matina, Davao City. The reason for the excitement was that the well-loved and respected Mary Ann “Baby” Maceda-Montemayor, the Honorary Consul of Hungary in Davao City, is one of the truly deserving recipients of the highest recognition given by Davao City. The madam personally requested me to be in attendance as a member of her family. I’ve known and admired dear Baby Maceda-Montemayor as a prim, proper and outstanding lady achiever of the old school since I was a young boy in shorts. I’ve always told her Maceda relatives, who became my friends when I was studying in Manila, that Baby is, unquestionably, “Davao’s Miss Diplomacy.” She is well-known in the business, travel, restaurant and hospitality industry in Mindanao. One of the things I admire most in Baby is her pioneering spirit and staunch support in the promotion of the indigenous culture of Davao and Mindanao. She is, herself, an admirable walking showcase of Mindanao’s arts and crafts through her stylish fashion sense, her love for Mindanaoan visual arts, music and dance. Closing remarks by Datu Bago 2015 awardee Dr. Guillermo P. Torres, Jr.
No less than the Cultural Center of the Philippines Chairperson Margarita Moran-Floirendo (Datu Bago awardee 2004), Baby’s BFF in today’s lingo, read Baby’s citation: “Mary Ann Maceda-Montemayor is recognized for raising the level of awareness and appreciation for Davao’s capacity to host important national and international events as well as in promoting Davao as a globally competitive destination for tourism and investment…She is a successful entrepreneur who is able to prove that integrating the diversity of Davao’s indigenous culture and the ingenuity of local micro-entrepreneurs makes the City a unique tourism and investment destination.” Baby is the third member of the Montemayor family after Alberto C. Montemayor (1978) and Patria G. Montemayor (1994) to receive the award which was witnessed by her happy family members namely Binggoy Garcia Montemayor, Cong. Karlo and Marga Nograles, and Mariou Montemayor-Sian. The Datu Bago Awardees for 2019 include Koronado B. Apuzen, a lawyer by profession who used the law to serve the least fortunate members of society. He has been promoting the rights and welfare of workers, farmers, agrarian beneficiaries and rural cooperatives. Rodolfo M. Mande is one inspiring leader and educator from the Matigsalog tribe who has been working hard to promote indigenous culture to ensure his tribe’s cultural legacy and inclusion in the City’s economic, political and social life. Ines P. Mallari is a Japanese descendant who dedicates her life in strengthening Philippine-Japan good relations through her dedicated work in the education of Filipino-Japanese descendants at the Philippine Nikkeijin Kai Kokusai Daigaku in Lanang, Davao City. Antonio B. Partoza, Jr., is a visionary entrepreneur and philanthropist behind the Partoza Durian Farm and the Balay Pasilungan which is a privately funded shelter for homeless street children of Davao City. Mayor Sara Duterte-Carpio, who was introduced by Datu Bago awardee 2004 Salvacion U. Leuenberger with the assistance of Pilar C. Braga (Chairperson of the Datu Bago Awards), personally conferred this year’s Datu Bago Awards to Mary Ann Maceda-Montemayor, Koronado B. Apuzen, Rodolfo M. Mande, Ines P. Mallari and Antonio B. Partoza, Jr. in the program hosted by Datu Bago awardee 2015 Amelia B. Bonifacio. Member of the Board of Trustees, Dr. Gulillermo “Willie” P. Torres, warmly welcomed the VIP guests headed by Japanese Consul General Yoshiaki Miwa, Indonesian Charge d’ Affaires Endah R. Yuliarti Farry, Hon. Bangladesh Consul Purita Arsenia “Joji” Ilagan-Bian, Antonio T. Uy, Dr. Julian P. Rodriguez, Jr., Rene I. Oboza, Alfonso Guinoo, Aida Ford, Irene M. Santiago, the Inigos, Davao City Administrator Zuleika Lopez, among many others. 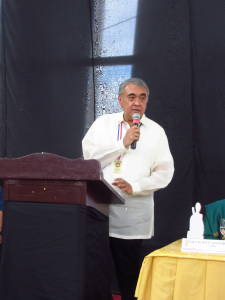 Dr. Torres, a Datu Bago awardee 2015, also delivered the closing remarks. As in the past years, the University of Mindanao Chorale did a fine performance in singing the Doxology, the Philippine National Anthem and Tayo ay Dabawenyo in formally opening the program. Congratulations to all the Datu Bago 2019 awardees; and Happy Araw ng Davao everybody. Family Life: Building strong families – Celebrate the Good News!